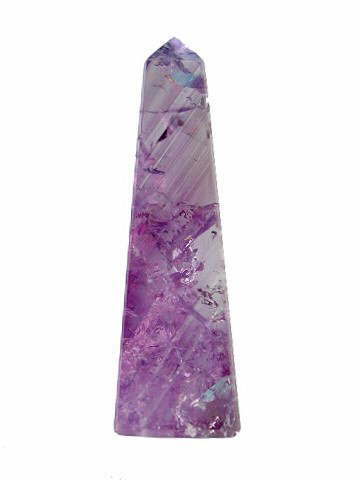 A Grade, polished Ametrine Obelisk. Far, far better than it appears in the photo. This gorgeous combination-crystal is an exquisite, deep violet colour (not as blue as it looks in the picture). It has superb clarity, is packed with soft partial phantom lines (not quite as obvious as in the photo) and it has some beautiful, light-bearing rainbows with a soft splash of Citrine. The Citrine part in this lovely obelisks is very pale it is undeniably Ametrine. Ametrine is a mixture of Amethyst and Citrine together in one stone. Citrine is actually heated Amethyst. This process can occur naturally when part of an Amethyst cluster is exposed to heated rocks in the earth transforming the part nearest the heat source into Citrine. The result is a crystal part Amethyst, part Citrine, otherwise known as Ametrine. Most commercially available Ametrine is produced by artificially heating one part of an Amethyst crystal; however the outcome is the same - Ametrine, and the crystal, not unsurprisingly, shares the properties of both Amethyst and Citrine. This fusion of these two powerful energies, metaphysically speaking, produces a fast acting combination. It has many uses including the following; it provides a connection between the physical and astral realms and once there, provides psychic protection for your work, helps source the underlying reasons for chronic disease; getting right to the core of a problem and can help reduce stress or tension induced headaches. Ametrine also opens the Third Eye or Brow chakra; bringing clarity and perception to visions. This is a very dynamic, fast acting stone, excellent to place in the centre of a grid or to use both prior to and during meditation, for the double benefits of firstly, helping to make you more receptive, and secondly providing protection, and if you’re looking to bring about change in your life this may be the stone for you; Amethyst helps you visualize the change you want to and Citrine helps you manifest it!